This serene property of 35 acres, with outstanding alluvial soils, is located in the prestigious suburb of Dulong. This highly sought after area is only 30 minutes from the Sunshine Coast beaches, restaurants and shopping. Also, only a 5 – 10 minute drive inland are the quaint tourist towns of Mapleton, Flaxton and Montville, with all they have to offer. The outstanding alluvial soils are a highlight of the property serviced by excellent annual rainfall, averaging 1750 mm per annum. The acreage has previously been a successful French Pure Limousin Stud and has also catered to the vendor’s grandchildren’s horses. It has great potential to be a viable horse and cattle property, once again. The homestead has been designed with considerable thought. The high ceilings and vents, coupled with tinted windows, keep the house cool during the hot summer months. The rooms are all expansive. All four bedrooms have BIR’s, with the master bedroom having a large ensuite. There are 2 additional well-appointed family bathrooms. 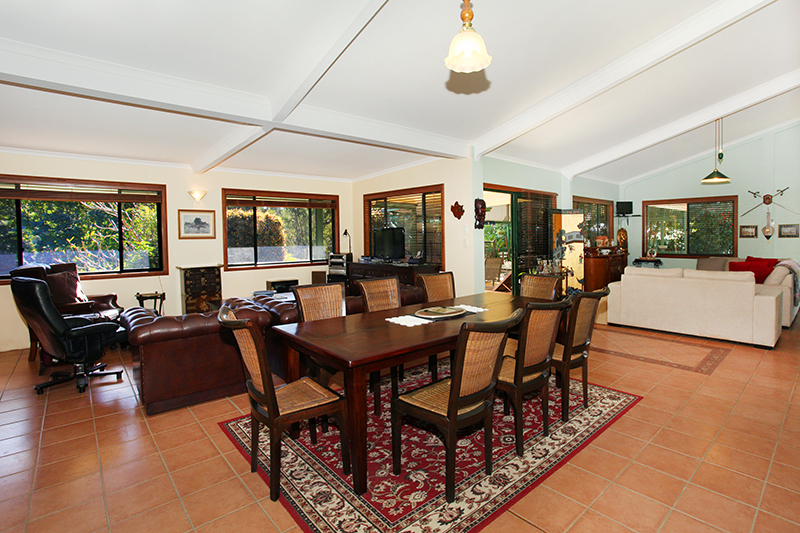 The airy open plan living, dining and kitchen area are perfect for family and entertaining. Most of the entertainment takes place on the back patio, where there is a BBQ, pizza oven, and spa. Views of the valley and neighbouring hills from the rear of the house are particularly delightful. Adjacent to the house are 3 sheds. The first shed is 12m x 9m which has a mezzanine floor with living quarters. It comes with a pot belly stove and 3-phase power. The 9m x 9m shed is for machinery and the 6m x 6m functions as a double garage. The roof surfaces of the home and sheds act as a rain catchment for the 20,000 gallons of rainwater storage. The greenness of the pastures, even during the driest rainfall years, testifies to the outstanding alluvial soils. The pastures are a mixture of red and white Haifa clover, kikuyu, regular and African couch and setaria. The vendor affirms that the land has supported 50 breeders. There are 8 paddocks that have pockets of trees which have been preserved for shelter for cows calving. The back paddocks have concrete causeways through the seasonal stream beds. The cattle fencing is in very good repair, as are the cattle yards. A 10 tonne feeder is in the top paddock, conveniently located next to the shaded cattle yards. Water troughs over the property are gravity fed. Bordering the horseshoe-shaped silt dam is an area where an acre or two of lucerne could be planted. The outstanding alluvial soils would support an excellent stand of lucerne. During the dry season, the area could be irrigated using the 8 hp pump.